Beginning in October 2018 and continuing through December 2019, organizations across the country will mark the 50th anniversary of the Apollo program with events, programs, exhibitions and more that celebrate this iconic mission. Smithsonian Affiliates will be hosting events throughout the year. Find a celebration near you! Columbia Memorial Space Center (Downey, California) opens Achieving the Impossible: The Life and Dreams of Shelby Jacobs, a new exhibition showcasing the achievements of Shelby Jacobs, the engineer who developed the camera systems that captured amazing images during the Apollo missions, like the famous “Blue Marble” image. The exhibit runs through the Spring 2019. The Museum of Flight (Seattle, Washington) invites you to “party like it’s 1969” during Seattle’s Summer of Space, featuring special events all summer long as we all celebrate the 50th anniversary of the very first manned mission to land on the moon. In honor of the Apollo 10 mission, whose call signs included the names of Peanuts characters Charlie Brown and Snoopy, which became Apollo 10’s semi-official mascots, the Charles Schulz Museum and Research Center and the Museum will host Apollo 10 and Pop Culture: Space Travel through the Ages a panel and guest speaker discussion. May 4, 2019. The Museum of Arts and Sciences (Daytona Beach, Florida) opens To Choose Our Destiny: The Lasting Legacy of the Apollo 11 Moon Landing exhibition, taking visitors back in time to the space race, NASA’s revolutionary engineering work through to the everlasting effects of the endeavor that are still being felt today. May, 18, 2019. On May 25, take Lunar Tour Alpha, the first public tour of the exhibition with Seth Mayo, Curator of Astronomy. The Museum of Arts and Sciences (Daytona Beach, Florida) celebrates the Apollo 11 Moon Landing with Movie Night in the Planetarium, screening the biographical drama, First Man. June 14, 15, 2019. The Center will commemorate Apollo 11’s journey to the moon and look to the future with America’s Next Great Ship, NASA’s Space Launch System. Rockets on Parade is a way to note Huntsville’s contributions to the space program. Model SLS rockets will be displayed around the city. July 1, 2019. The week of the 50th Anniversary of the Apollo 11 mission begins with a Celebration Car Show with vehicles from the Apollo era on display. A full-scale, Polaris-powered Apollo Lunar Rover replica will also be featured at this event on the Rocket Center grounds July 13, 2019. Launch your own rocket during the Global Rocket Launch Challenge at the Space Center! All types of rockets are welcome, and no launch is too small so start spreading the word and get ready to celebrate! July 16, 2019. Commemorate the 50th Anniversary of Apollo 11’s landing at the North Carolina Museum of History (Raleigh, North Carolina)! The One Giant Leap Festival will feature hands-on crafts, demonstrations, and activities—including a virtual-reality lab where you can “travel” to space and “be” the first person on the Moon. More and more out-of-this-world fun will be announced as the festival nears, July 20! See mission re-enactments both live and online, highlighting what happened in the Apollo Mission Support Room in Downey, CA, during the mission through live tweeting the moon landing and retrofitting their Mission Control room to appear as it did in 1969. July 16 – 24, 2019. Join the Lunar Pub Crawl! Participants will visit local “watering holes” that remain from the Apollo Era where engineers working on the Apollo capsules frequented. Each stop will include a veteran of the Apollo Program who’ll share stories about their historic work. July 18, 2019. The Space Center and the City of Downey (birthplace of the Apollo capsules) will be transported into the past, recreating the Downey of 1969 with activities happening all around the city. The entire community is encouraged to dress up in vintage 1969 clothing while participating in SPACETOWN, USA! July 20, 2019. Join a 5K Moon Walk around the 88-acre site on July 21, 2019. On July 18, 9-10am, Join Coffee @ the Cosmo to hear experts present on the 50th Anniversary of the Apollo 11 lunar landing while enjoying coffee and pastries. On July 20, enjoy Landing on the Lawn, a variety of family-friendly events celebrating the anniversary of the historic lunar landing! Activities include a puppet show, a Moon “selfie” station, giant lawn games, a showing of the CBS footage of the lunar landing, Moon viewing with Space Science educators, and a screening of the documentary In the Shadow of the Moon on an outdoor screen. Visit Destination Moon on the day the astronauts stepped foot on the moon back in 1969. July 20, 2019. Join a panel of former aerospace professionals from the Apollo Era who designed/built the spacecraft that took us to the Moon! The conversation, From L.A. to the Moon: 50th Anniversary of the Apollo Landing tells the story of humanity’s greatest technical achievement from those who made it happen. At the Columbia Memorial Space Center on September 22, 2019. The traveling exhibition will bring the iconic Apollo 11 Command Module Columbia and one-of-a-kind artifacts from this historic mission to four cities—its first national tour since 1970/71. Developed by the National Air and Space Museum and organized for travel by the Smithsonian Institution Traveling Exhibition Service, Destination Moon tour will travel exclusively to Smithsonian Affiliates through 2019. Eyes will be on The Museum of Flight in Seattle, Washington, which will host the exhibition during the 50th anniversary of the Moon landing in 2019. Go inside the Apollo 11 Command Capsule through a high-resolution 3-D scan. Anyone with an internet connection can explore the entire craft – inside and out – which is not possible when the capsule is at a museum. Learning Lab puts the treasures of the world’s largest museum, education, and research complex within reach. The Lab is a free, interactive platform for discovering millions of authentic digital resources, creating content with online tools, and sharing in the Smithsonian’s expansive community of knowledge and learning. Browse one of the Destination Moon collections below. 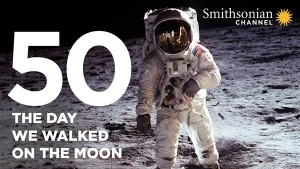 Special screenings of The Day We Walked On The Moon, a Smithsonian Channel documentary marking the 50th anniversary of man’s first steps on the lunar surface. The program features interviews from key figures in Mission Control, Contemporary astronauts, and the families of Buzz Aldrin and Neil Armstrong. Details on how to request screenings here. Over 15 months, the Moon Landing in Context project will engage in panel discussions, lectures, exhibits, and student projects to explore the history and social environment that were inevitably intertwined with the events that led to the Moon Landing or were affected by it. Learn more here. The project, is directed by Dr. Irene Porro of the McAuliffe Center for Integrated Science Learning and benefits from the scholarly contribution of Framingham State University, a Smithsonian Affiliate, as well as Smithsonian Institution experts, and scholars from other academic institutions.